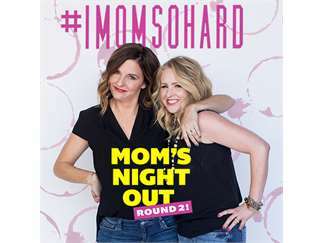 #IMOMSOHARD - Mom's Night Out Round 2 comes to DeVos Performance Hall on Saturday, July 13th at 7:00PM. Leave the men and kids at home for this ages 18 and up show! Moms, best friends and funny ladies Kristin Hensley and Jen Smedley are the creators of the viral web-series #IMOMSOHARD, where they discuss the good, the bad and the funny about motherhood - with the help of a bottle of red wine! #IMOMSOHARD has grown to over 1.5 millions followers across platforms and over 120 million video views. One of their most shared episodes, I Swimsuit Season So Hard, where the moms tried on the summer's hottest/most ridiculous swimwear, garnered over 20 million views and coverage in the world's top news outlets. They have recently appeared on The Today Show and The Doctors, to name a few, as well as being chosen for People Magazine's best of 2017. Part of their plan for complete world mom-ination includes their own half-hour, multi-cam comedy which the moms are developing with CBS. Tickets go on sale Friday, February 15th at 10AM. Ticket prices are subject to change. For current ticket prices, visit Ticketmaster.com. Ticket prices may vary, as market pricing applies to all tickets. Prices may fluctuate based on supply and demand. Tickets may be purchased at the Van Andel Arena® and DeVos Place® convention center box offices, charge by phone: 1.800.745.3000 or on-line at Ticketmaster.com. A ticket limit of 8 will apply to every order.